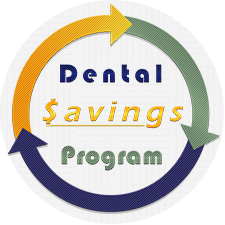 We now offer an In House Dental & Periodontal Savings Program designed to help you budget your annual routine dental care with additional benefits such as discounts on some of our most popular dental treatments. Plans are available for both individuals and families. 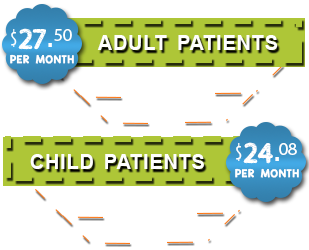 When you join our dental savings program you pay an annual rate of $319 for adults and/or $279 for children. That's a 15% savings over our normal rates if you were to pay for everything separately. All you have to do is pay the one time annual fee, schedule the appointments, and show up! We'll take care of the rest! (Must pay in full with check or cash at time of service to receive full discount. 7% discount applied if paying with credit card). Please note that if paying with a credit card a total of 3% will be deducted from your original 15% discount. The same policy applies to the discount received on work above standard recall. Payments must be made in FULL at TIME OF SERVICE to receive discount(s). Patients recommended into our Periodontal Maintenance Program require more attention and further treatment than what routine visits cover. We need to see these patients three to four times per year, once every three to four months to halt the progression of any periodontal disease. The frequency of your visits will be determined by your hygienist and/or dentist. By opting into our savings program, you will receive a 15% discount on three periodontal maintenance sessions, as well as a 10% discount on any additional indicated services. All you have to do is pay the $428.40 one-time annual fee in full, schedule the appointments, and show up. We'll take care of the rest! The annual total is non-refundable & cannot be carried over if 3 sessions are not maintained. 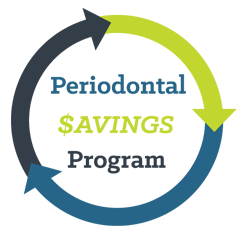 The $428.40 one time annual payment guarantees 3 complete perio-maintenance sessions for the year. Members of this program receive a 10% discount on other work, such as, but not limited to, crowns, fillings, scaling & root planing, laser therapy, and any additional cleanings. Fees are subject to periodic adjustment at time of renewal.